Kills 99.99% of most common germs that may cause illness. Scientifically advanced, patent-pending foam formulation kills the most germs. Outperforms other hand sanitizers ounce for ounce. Enhanced with a nourishing blend of four different skin conditioners that are clinically proven to help maintain skin health. Milder on skin than hand washing. 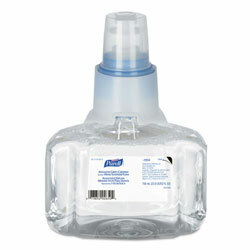 Hand Sanitizers Type: Foam; Color(s): Clear; For Use With: PURELL® LTX-7™ Dispensers; Capacity (Volume): 700 mL. Hand Sanitizers from Purell! 65 In Stock today.